While auto body repairs restore the mechanical efficiency of wrecked vehicles, the exterior appearance can be stored through auto painting. Until the car painting is done, you will always be reminded of the accident and how your car looks. If you are in Tacoma, WA searching for an auto paint shop that can make your damaged vehicle as good as new, visit Lakewood Auto Body. Our auto paint shop has been serving Tacoma since 1962 and is reputed for giving factory finish to vehicles it works on. Whether your vehicle needs minor scratch repair or complete body auto painting, come to us. Our custom auto paint shop also caters to Tacoma residents who wish to give their vehicles a new look with a fresh coat of paint. 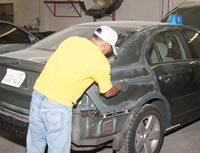 We follow a detailed car painting process while working on Tacoma vehicles that have been in a collision. Our goal is to do such a fine paint job that it is difficult to tell that the car had ever been damaged or has lost its original paint. Complementary hand detail after the car painting puts the finishing touches on your Tacoma vehicle, and gives it a showroom-like look, smell, and feel. Wish to give your old car or truck a brand new look but are deterred by the costs of car painting? Wondering how much it cost to paint a car? Relax! We are a fair-priced auto paint shop that offers affordable custom auto painting services for Tacoma residents. All our auto painting jobs for Tacoma cars & trucks are backed by a lifetime warrantee. Do not take your prized vehicle to just any auto paint shop in Tacoma. Visit Lakewood Auto Body. Call 253-581-0220 to learn more.